The course is over! Thanks to everyone for a great semester, and enjoy your summer. Joseph A Gallian, Contemporary Abstract Algebra, 8th ed. The third midterm exam will be in class on Friday, April 25. It will cover Chapters 10 through 14 (up through ideals and factor rings). The second midterm exam was in class on Friday, March 28. It covered up through Chapter 9 (normal subgroups and factor groups). The first midterm exam was Friday, February 21, as in the syllabus. The exam covered up through Chapter 6 (Isomorphisms). Keeler’s theorem and products of distinct transpositions: An episode of Futurama features a two-body mind-switching machine which will not work more than once on the same pair of bodies. After the Futurama community engages in a mind-switching spree, the question is asked, “Can the switching be undone so as to restore all minds to their original bodies?” Ken Keeler found an algorithm that undoes any mind-scrambling permutation with the aid of two “outsiders.” We refine Keeler’s result by providing a more efficient algorithm that uses the smallest possible number of switches. Permutations and the 15-puzzle from class on 3 Feb. Skip to Section 5 for the good stuff, then come back to Section 4 for the details. Group theory and Rubik’s Cube from class on 3 Feb. Skip to Section 3. 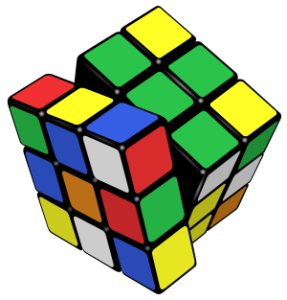 There are about 519 quintillion conceivable configurations for the Rubik’s Cube, but only 1/12 of them are “valid”. MAT534-spring2014-hw09 posted 21 March 2014, due Monday 31 March.